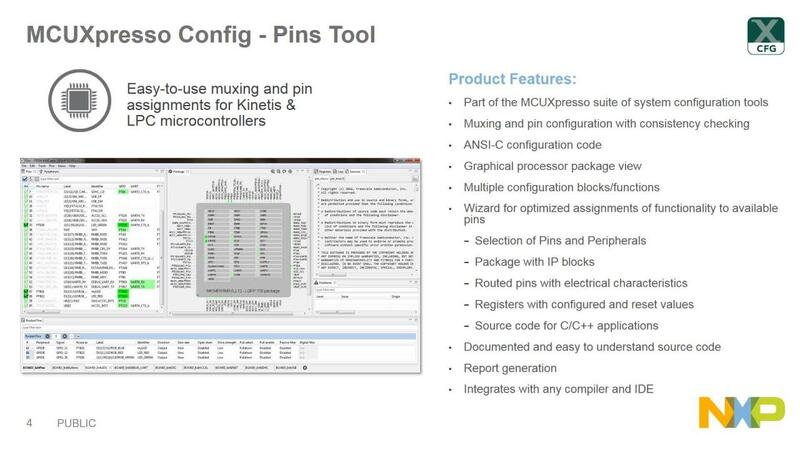 The MCUXpresso Config Tools is an integrated suite of configuration tools that help guide users from first evaluation to production software development when designing with NXP's microcontrollers based on Arm® Cortex®-M cores, including i.MX RT, LPC, and Kinetis® MCUs. These configuration tools allow developers to quickly build a custom SDK and leverage pins, clocks and peripheral tools to generate initialization C code for custom board support. The following tools help you design with the MCUXpresso software and tools. All tools and runtime software are provided free-of-charge. The assembly and C source code are provided under permissive open-source licensing. Support is provided through the MCUXpresso Config Tools Community Forum. NOTE: Supported devices can be found by visiting the SDK Builder and clicking on "Select Development Board". The MCUXpresso Config Tools are fully integrated into the MCUXpresso IDE, and also available as a download for use with other supported IDEs, including Arm Keil, IAR EWARM, and others. If using the MCUXpresso IDE, no additional download of Config Tools is required. 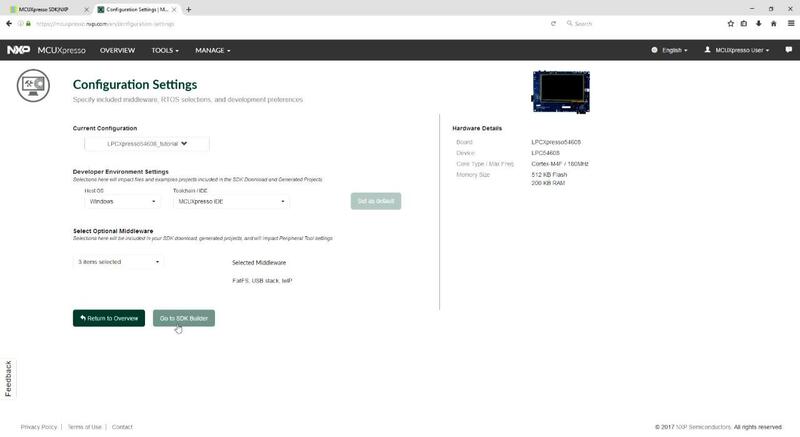 Packages custom SDKs based on user selections of MCU, evaluation board, and optional software components for use with MCUXpresso software and tools. Assigns internal signals to external pins, sets electrical properties, I/O conflict resolution options and generates ANSI-C source code that drops into the MCUXpresso SDK environment. For a graphical representation of the MCU clock tree system and interactive user controls as well as assistance with system fine-tuning. Enables selection of desired peripherals (i.e. UART, ADC, SPI, etc.) and generates initialization code, and configures higher level application code for USB projects. Works directly with existing SDK-based IDE projects with generated Pins, Clocks, and Peripheral source files. Creates a standalone SDK project based on an example application available within SDK release.